Wolfgang Amadeus Mozart juggled financial difficulties and a rocky personal life, all while trying to make an extraordinary creative contribution. Sound familiar? Mozart wrote his first opera when he was 12 years old. He was, according to Haydn, “the greatest composer I know, either personally or by reputation.” Yet Mozart always struggled to create, innovate, and pay the bills on time. Until 1781, Archbishop Colloredo was Mozart’s chief patron. However, Mozart bristled under his patronage. Colloredo wouldn’t let Mozart make money from private shows or rub shoulders with influential people. Colloredo’s logic was simple. The less Mozart earned and the fewer people he met, the more Mozart would focus on his productions for the Salzburg court. Mozart wanted to quit, but was reluctant to do so because his father also worked at the court and he didn’t want to sour relations. After Mozart quit, his creative output increased, but he was forced to struggle and endure financial hardships. Lesson for innovators: This lesson isn’t: “Quit your job!” But the lesson is to quit your current situation if you can move into a better space, creatively and emotionally, if not financially. If you will not be more creative or productive, then maybe quitting isn’t the best move. In 18th-century Austria, a composer had to work hard to find a theater space. There was a lot of competition and limited availability. Mozart decided to organize solo piano concerts at unconventional venues like restaurants and apartment buildings. He usually played his own piano concertos to “display the full range of his keyboard capabilities,” or he’d organize smaller orchestras. In many ways, Mozart was the forerunner of today’s bands that play in a variety of venues. The music he wrote during this period (1782-1786) was both elegant and simple, and he strived to please not only the aristocracy, but all classes. “These concertos,” Mozart wrote to his father with characteristic bravado, “are a happy medium between what is too easy and too difficult; they are brilliant, pleasing to the air.” The audience kept coming back for more, and Mozart kept on writing and performing to please his customers. Solomon tells us, “Rarely had anyone given more than one concert in a season.” Mozart’s productivity and fresh musical ideas enabled him to out-write and outperform his contemporaries. Lesson for innovators: Keep updating your ideas. Mozart knew he couldn’t make a profit by playing the same piece over and over. He creatively refreshed his ideas, which increased his productivity. 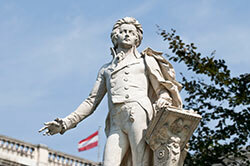 Mozart toured Europe as a child, performing for various courts and dignitaries. His constant travels exposed him to many different styles of music-;notably Italian and German. Daniel J. Boorstein notes, “No other composer so succeeded in marrying Italian homophony with German polyphony to make a European music.” Mozart’s contemporaries, such as Bach and Haydn, never had traveled as widely--Bach hadn’t even been to Italy--and were not exposed to as many musical styles. Lesson for innovators: Travel far and wide (as your finances allow) and leave yourself open to new experiences. By going further afield, you can learn new things that you can integrate into what you already know and come up with something completely different. Lesson for innovators: Make time for yourself. Mozart spent a lot of time touring and in the public eye, but he knew his best work came in moments of isolation. You don’t need to be in the limelight to accomplish your best work. Even if you never plan to pitch a venture capitalist, you should still have a financial plan that can stand up to tough scrutiny.